CAPE CANAVERAL, Florida -- Buoy 41010, the station that was moored 120 nautical miles east of Cape Canaveral, Florida washed ashore recently in Carnota, Spain, the National Weather Service in Melbourne, Florida reported. 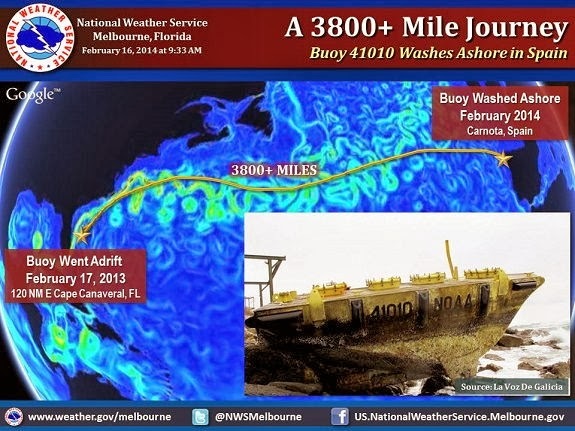 The buoy broke its mooring and went adrift on February 17, 2013 and stopped relaying critical oceanographic and meteorological information off of Florida's Space Coast in March of 2013. Postioning of the buoy was lost on April 24, 2013. Since then, currents in the Atlantic Ocean (including the Gulf Stream, seen in the above graphic as bright swirls) have carried the buoy over 3,800 miles from its original moored position, the National Weather Service said. The buoy is funded by NASA and owned and maintained by the U.S. National Data Buoy Center. "The NOAA National Data Buoy Center has deferred annual maintenance for buoys and C-MAN stations until further notice. We hope to resume maintenance of the coastal and offshore weather buoys and C-MAN network next year, pending adequate funding in FY14," NOAA said in a statement on its website.